A few weekends I bbq'd with some friends and of course, I suggested I would make the board. Here's a fun fact, I absolutely love wine and cheese. I'm always making cheese boards for appetizers for parties or even before dinner on a casual weekend night in. 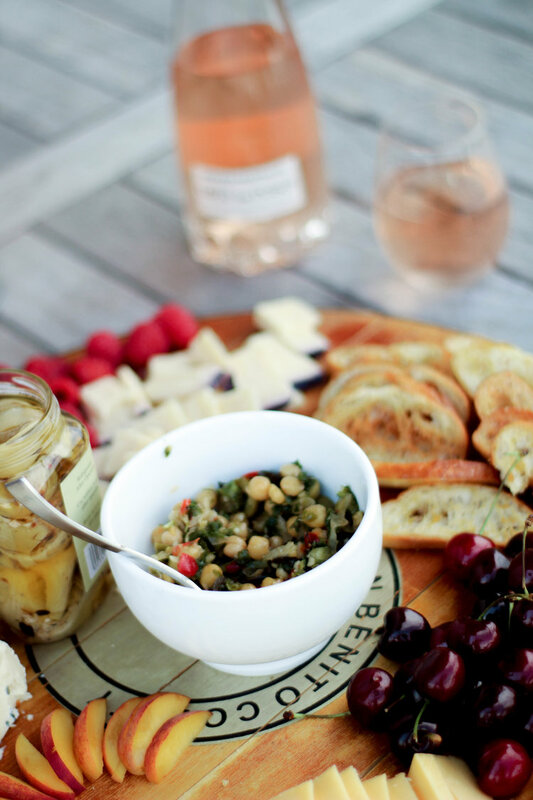 In my eye's cheese boards are perfect to pick on while sipping wine and chatting and they are so tasty! My love really started for cheese when I was about 19, I was living in California pursuing acting and I got a job at a cute little cafe where they served the cutest cheese boards. I ended up really enjoying it and getting into the anatomy of a cheese plate. I really enjoy sprucing up my boards and offering an assortment of different flavors. I wanted to share with you all some tips and suggestions to make your own cheese plate at home. As mentioned this is the perfect picking to bring with you to a party and you'll be sure to wow your friends! 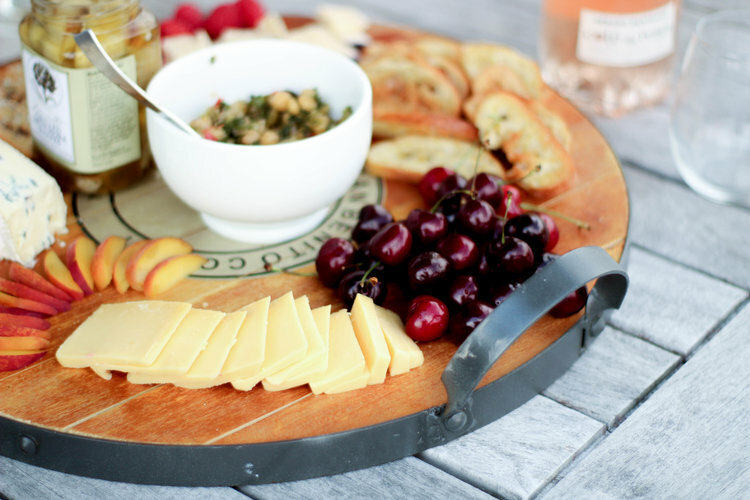 You want to give your board a variety of cheeses. I like to offer at least a minimum of three types of cheeses. Keep your board interesting, I like to choose cheeses based on milk type (sheep, cow, goat) and then I like to chose the texture (hard, semi hard, soft). 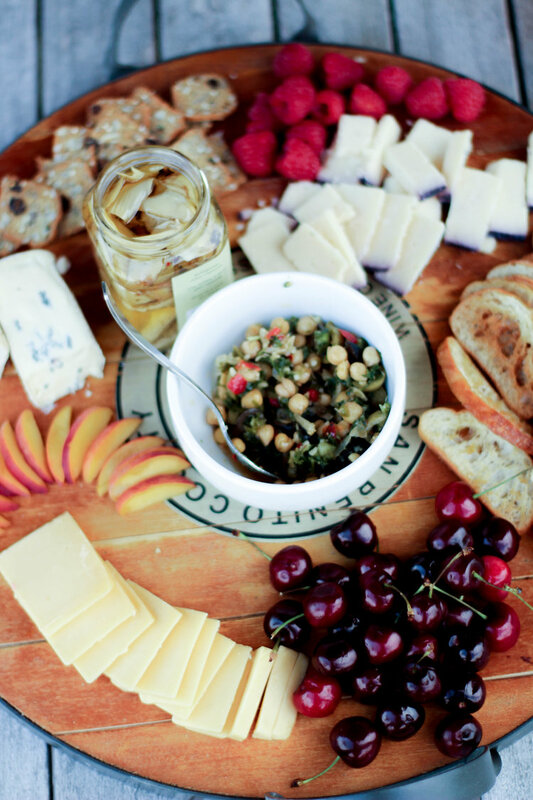 After you've picked your cheeses you'll want to add some sweet stuff to your board. Sweet pair well with just about any cheese. I love to drizzle some honey on sharper cheeses like blue cheese. Fruit is always a good idea on a board, apples slices, peach slices or fresh cherries. You can also add a spread like fig. Next you'll like to add something salty, I typically will do two elements. I love mini pickles, cornichon's and also salted marcona almonds are my favorite, but really any kind of nut would pair nicely on a board and even an olive spread. The last element is the bread and crackers and you can really have fun with this part (yes bread can be fun!) I like to get a french baguette and cut it up into slices, brush it with olive oil and toast it up. Trader Joe's has a nice assortment, gorgonzola crackers, fig and olive crisps or just plain toasts. Remember to have fun and explore thats what I've done. There have been some cheeses I wasn't a fan of or some elements didn't compliment each other. Through trial and error you will find what works best for your taste buds and what works well. The world of cheese is endless, I'd love to hear your favorite cheeses in the comments below!